Albert Khoshaba was one of the most outstanding footballers of his generation. As a youngster he started playing football in Habbaniya alongside his friends and the airmen at the RAF base. The talented left-sided player was one of the last players to come out of Habbaniya after the likes of Aram Karam, Youl Gorgis, Ammo Baba, Edison and Youra Eshaya, who all started their playing careers there before moving onto greater things in other places in Iraq. Like many Assyrian greats, Albert participated in a variety of sports while growing up at the RAF Base but there were no questions about what Albert wanted to be when grew up, a footballer. He started his playing career in 1954 when he joined the R.A.F. Employees' (Assyrian) Club, a year later he was called up for his national service and played for the Army team known as the 3rd Battalion (Al-Fareeka Al-Thalatha) until 1957. After his discharge from his military service, he moved across Baghdad and joined the Passenger Transport Department team (Al Maslaha Naqil Al-Rakab), where he played for two seasons. During the midst of uncertainty of life in Iraq brought upon after the 1958 revolution, Albert emigrated to the United Kingdom in 1959 in the hope of living there. However little under a year later, he became homesick and returned back to Iraq. He quickly joined the Baghdad based club Police team (Al-Shorta), where he was one of the star players in their team before he returned to his former club Al-Maslaha playing alongside Mohammed Thamir, Hormis Goriel, Qais Hameed, Mohammed Majid and Youl Gorgis. Albert was distinguished from other players due to his agility, calm and composed nature and his remarkable pace and speed, while he was also a fine dribbler with the ball. 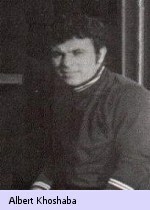 Albert was a regular in the Iraqi national team during the mid to late 60s making nearly 40 appearances for Iraq alongside players such as Hamid Fawzi, Hassan Balah, Jabar Rashak, Shidrak Yousef, Gorgis Ismail, Gilbert Awekam, Mahmoud Asad, Nouri Dhiab, Hisham Atta Ajaj and Qasim "Zawiya" Mahmoud. On the pitch, Albert was the matinee idol; his blond hair, olive skin and broad smile enticed him to the fans, especially the girls, while off it, he was boyish, modest and admirably intelligent. One of his greatest accomplishments came in late 1966, when he was selected by coach Adil Bashir to play for an Baghdad XI in the opening game of the Iraqi People’s National stadium against Benfica of Portugal, who included the greatest player in the world at the time Eusebio in their side. Albert played on the left-side of midfield with fellow Assyrian Shidrak Yousef in attacking midfield and Hussein Hashim on the right in a more defensive position in a 3 man midfield, part of coach Adil Bashir’s 4-3-3 formation. Benfica went into half-time with 1-0 lead but 10 minutes into the 2nd half Shidrak and Albert combined to set-up the equaliser for Captain Qasim "Zawiya" Mahmoud, who hit a thunderous shot from 12 yards to beat the stranded keeper. 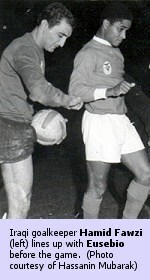 Alberto as he was sometimes known to his adoring fans because of his South American or European style, even outshone Eusebio on the day as he picked up the man of the match award. However, he was unable to help his side to victory as the Baghdad XI lost 2-1 with a goal from the Portuguese giants in the last ten minutes of the game. 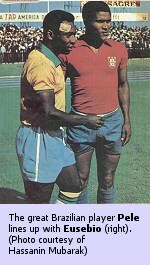 After the game, the 1966 World Cup star Eusebio came up to Albert commended him on his excellent performance and exchanged shirts with him. During that night, the Mozambique born Eusebio told everyone that he had never seen any player as good as Albert on the left side of midfield. One fan remembers the player with great fondness. 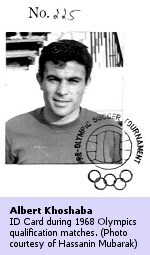 This photo was taken from his Olympic ID card for the qualifying games in January 1968. During the Olympic qualifiers in Bangkok, Thailand where Iraq missed out on a place in the Olympic finals in Mexico finishing 2nd behind the hosts in a group also featuring Indonesia. Albert was the player selected to hold the Iraqi flag on the field, an honour given only to exemplary individuals.